Invenergy CEO Home Demo: No Fracked Gas Plant! 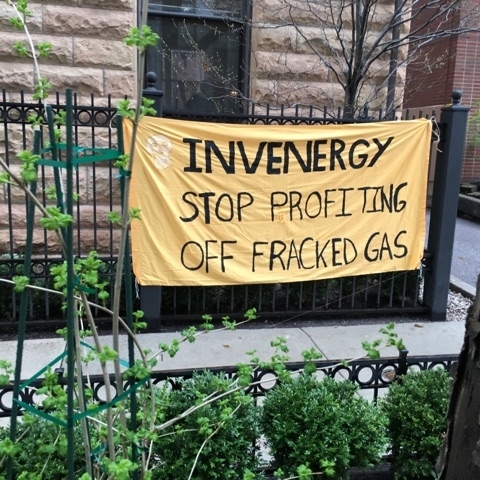 Chicago, IL–Early Thursday morning, activists with Rising Tide Chicago, hung up banners on metal fencing outside a mansion in Chicago’s gold coast neighborhood that Michael Polsky, CEO of Invenergy, owns and occupies. The banners read, “Polski: No Clear River Natural Gas Plant” and “Invenergy: Stop Proffiting Off Fracked Gas.” Polski, has recently been the target of climate justice activists for Invenergy’s proposed 700 million dollar clear river natural gas power plant in Burrillville, Rhode Island. The action is part of a series of nationwide actions promoted by Fighting Against Natural Gas (F.A.N.G.) during the week of April 18-24, targeting Invenergy and other companies for their expansion of climate disrupting natural gas infrastructure in the context in the Northeast in the face of a rapidly changing climate. Invenergy’s “Clear River Energy Center” is one of the company’s latest investments in natural gas. Until recently, Invenergy has primarily pursued business through federal and state-subsidized solar and wind renewable energies. According to Crain’s Chicago, “Invenergy’s growth nonetheless largely is due to state and federal policies that mandated and subsidized greater use of renewable power.” Invenergy is leveraging capital boosted primarily by government subsidies to jump into the marketization of fracked gas energy sources. Invenergy headquarters are in Chicago and they employ 300 people at their downtown Chicago office. ← Chicagoans Flood the Banks!